Robert L. Habush is the Chairman of the Board of Habush Habush & Rottier S.C. ® He received his undergraduate degree and his juris doctor from the University of Wisconsin. Mr. Habush was Order of the Coif and a member of the Law Review. Mr. Habush is a Fellow of the International Academy of Trial Lawyers, where he served on the Board of Directors. He is a Fellow of the International Society of Barristers and the American Board of Professional Liability Attorneys. He is a member of the Inner Circle of Advocates. He is a Diplomat of the American Board of Trial Advocates and was the first President of the Wisconsin Chapter. He is certified as a Civil Trial Advocate by the National Board of Trial Advocacy and is listed in theBest Lawyers in America. 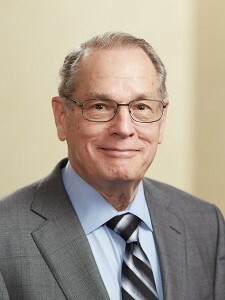 Mr. Habush has held leadership roles in the American Association for Justice(formerly ATLA), serving on the Board of Governors, 1969-1970 and 1983-1986, as National Parliamentarian, 1971-1972, as National Secretary, 1972-1973, as President-Elect and then President, 1985-1987. He has also been instrumental in the success of the Wisconsin Association for Justice, serving as its President from 1968-1969 and 1970-1971. Mr. Habush is admitted to practice before all Wisconsin courts and has been admitted pro hac vice in many courts around the country. He is a member of theAmerican Bar Association, the State Bar of Wisconsin and the Milwaukee Bar Association. He is a former member of the Board of Governors of the State Bar. Mr. Habush has taught courses at both the University of Wisconsin Law School and the Marquette University School of Law over the past twenty-five years. He has authored law review articles and was the author of “Cross-Examination of Non-Medical Experts” in the Art of Advocacy series by Matthew Bender Company. He has lectured before professional groups throughout the country in the area of trial practice. Mr. Habush has been named the recipient of the AAJ Harry Philo Award and Champion of Justice Award. The Wisconsin Association for Justice has named its annual award to an outstanding trial lawyer, “The Robert L. Habush Trial Lawyer of the Year Award.” He has achieved an AV® Preeminent™ Rating from his peers in the Martindale-Hubbell Law Directory for over 30 years. In 2001, for his victory in the Miller Park crane collapse case, Mr. Habush was named one of the top litigators in the United States. In addition to being named a 2014 Super Lawyer, he was also included on Super Lawyers’ 2014 “Top 50 Wisconsin” list and “Top 25 Milwaukee” list, and was the #1 point earner for the latter recognition. In 2014, the American Bar Association published a biography about Mr. Habush titled “Courtroom Avenger: The Challenges and Triumphs of Robert Habush,” written by Kurt Chandler. The attorneys of Habush Habush & Rottier S.C.® have represented injured people in all parts of Wisconsin and throughout the United States. This section contains a few of the recent cases our attorneys have successfully resolved for our clients. 16 million awarded to 8 men injured while working inside a silo at a power plant when a fire and explosion occurred. 6 million awarded to a woman hit head-on by semi which crossed the center line when its brakes locked up. 5.4 million to a woman who suffered a brain in jury after being hit by a dump truck. 5 million awarded to a man who suffered life-threatening electrical shock and severe burns upon contact with a power line. 3 million from an auto manufacturer to a woman injured by a defective seatbelt. 2.6 million to a woman who suffered brain damage from aspirin. 2.6 million to a child who suffered injuries due to medical malpractice. 2.5 million to a man injured while driving a rental car with bad tires. 2.4 million to a woman hit by a car. 2.2 million to a 17-year-old girl severely burned by a mobile home’s defective electrical system. 2.07 million to the family of a pregnant woman and her daughter who were killed by an intoxicated driver. 2 million from an auto manufacturer to a woman whose seatbelt failed in an accident. 2 million from an auto manufacturer to a person whose seatbelt failed. 2 million to a man injured by defective scaffolding. 2 million from an auto manufacturer to a woman injured by a defective seatbelt. 1.7 million to a child injured by medical malpractice. 1.5 million to a woman injured by medical malpractice. 1.2 million to a couple injured as a result of stray voltage on a farm. 1.2 million to a woman injured by medical malpractice. 1.1 million to a woman injured by medical malpractice. 1.1 million to a man injured by medical malpractice. 1 million to a woman who suffered a brain injury in an automobile accident. 801,381 awarded to the family of a woman who was killed by a driver who ran a red light. 410,000 for a woman who was sexually assaulted while she was in the hospital. 112,269 awarded to a woman who was attacked by her neighbor’s dog. Contributor to The Art of Advocacy Skills in Action Series –Cross-Examination of Non-Medical Experts Videotape Series, Matthew Bender & Co.
Contributor to Crashworthiness: AAJ Anthology Series, AAJ, 1989, Washington, D.C.
Contributor to Excellence in Advocacy – Trial Expertise and Wisdom from the National College of Advocacy, AAJ Press, 1992, Washington, D.C.